On May 2nd, The Black Lips took the stage to kick off their tour at Cat’s Cradle in the same manner in which a speeding locomotive charges down the tracks....with an insatiable amount of gusto and power. 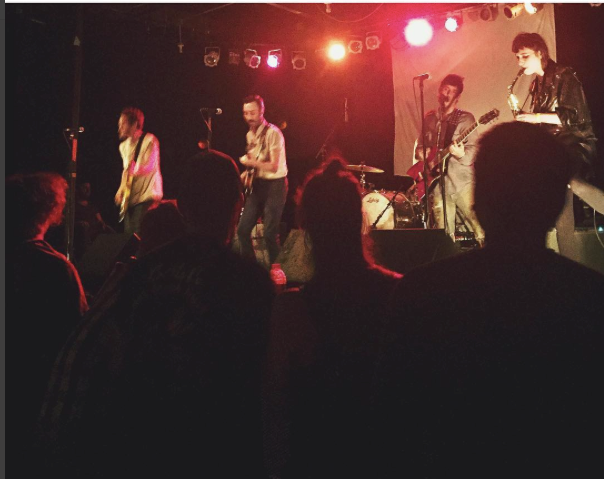 Electricity permeated the venue as the band played to a crowd of moshing fans, adding zest to what was otherwise an ordinary Tuesday evening in Carrboro, North Carolina. The Black Lips matched the degree energetic nature found in their songs in stage presence, erupting with vitality from the first note played to the last. Played early in the setlist was “Drive By Buddy,” a track that exudes groove from start to finish. With a slight sonic emulation of The Monkees, it succeeds in capsulating audience attention through its addictively rhythmic guitar riffs and sing-along inducing chorus (which instantaneously ensued). “Family Tree,” a track that is jam packed with dynamic variance and sonic juxtaposition followed shortly thereafter. The track kicks off with a swell of sound, complimented by a saxophone part that provides the song with an added level of distinctiveness. The song’s verses serve as a foil to its chorus, undertaking a cavernous tone before building into an exuberant and ebullient blast of sound. The crowd at Cat’s Cradle broke into sheer pandemonium as soon as the signature resonant bass line of “O Katrina,” a notoriously upbeat track from the 2007 album Good Bad Not Evil was played. Not one stationary body was in sight as the song’s identifying crunchy, distorted guitar riffs and thunderous drum fills were played. At the end of the night, the crowd left Cat’s Cradle sweaty, bruised, covered in a stranger’s beer, or any combination thereof. A band that does not perform with such an insatiable amount of sustained intensity simply cannot invoke that degree of reaction among audiences. However, The Black Lips did. Live, the band is the equivalent of a blazing meteor: they’re bright, riddled with an infectious energetic power, and are so alluring and unique that they cannot be ignored. The amount of vigor they put into their live performances is so wonderfully contagious that inciting an all-encompassing electric reaction among crowd members is seemingly inevitable. That skill is not only the hallmark of a great musician, but a great artist. Chicago, The Black Lips will be in town this weekend for not one, but two nights at The Empty Bottle. Night one is sold out, but grab your tickets to night two here. The rest of The Black Lips' tour dates can also be found here.